Included: flights from selected airports, transfers, accommodation in double room with breakfast, lunches and dinners, all visits and entrances, all tastings, guidance from TheAlps guide. Extra: drinks are not included in the board. Single room upon request. The tour can be customized according to your and your group's needs also other dates. Piedmont –the land at the foot of the mountain. The gently rolling landscape is pearled with small medieval villages, castles and fortresses. The Alps in the north reach impressive heights and everywhere wide-ranging vineyards. Here you find some of Italy’s, not to say the world's best wines, with Barolo, the king of wine, wine of kings, at the top of the throne. During our visit to Piedmont we stay in an agriturismo, a farmhouse, enjoying local flavors in the real slow-food spirit. It was here that the famous "resistance movement" started on small-scale family farms with traditional farming methods. You will meet a lot of charming personalities; truffle hunters and their dogs, wine farmers, bakers and cheesemakers. Our philosophy at TheAlps is completely in line with this type of tourism and we are pleased that there still are enthusiasts, who like us who put passion before expansion. Marta and Linnea from TheAlps and our sommelier Ilenia will be joining you on this tour. We meet at the airport and go together to our agriturismo Le Querce del Vareglio.The agriturismo is an old farmstead dating back to the late 17 nestled amidst the green of the famous wine producing zone of the Langhe and Roero. After check-in and maybe some unpacking we gather in the wine cellar together with the wine- and cheese makers themselves. Dinner will be at the agriturismo this first evening. A delicious breakfast buffet to start off the morning with the right foot. After an extra cup of creamy espresso, we linger our shoes for a walk in the beating heart of Barolo, among the ripe Nebbiolo grape. Our guide this morning is a Barolo DOCG wine grower. Around noon we spread our picnic blanket with a spectacular view over the UNESCO World Heritage landscape. After lunch, we visit a farm, specializing in organic hazelnuts, for show cooking and dégustation. In the afternoon there is time for relax and maybe a dip in the pool at Le Querche. The sisters Adrianna and Maria Teresa have carefully restored their grandparents farmstead. Tonight we have dinner in their place at the sweet Asti countryside. Today’s scenic walk will bring us to the the small town of Alba. Here we are welcomed by Antonio and his family who will show us how to make the their traditional sourdough bread. We have lunch here with the family's own wine in the glass. Alba is the absolute epicenter for Italian truffles. Here you will be participating in the search for the black gold together with the trifolau, truffle hunters and dogs troughout delightful oak- and hazle fields. You will learn more about truffle in the field, truffle in the food and how truffle dogs search. It's fascinating to see the dogs work! Surely you will also hear some good story, such as the one about the circus lion on the run ... the trifolau can go far to keep ahead of the competition. We stop in the middle of the forest, in the shadow of a beautiful stone house, for an aperitivo with local treats, honey, cheese and cold cuts. The evening goes on with a truffle dinner where our wine producer at Cascina Albano shows us how pick the right wine to the savoury character of truffles. In the morning we visit a small scale family-run dairy where we get to see how the production works and also taste both fresh- and ripened cheeses. Food and beer in perfect harmony. Our micro brewing friends from Maderé serve us lunch. 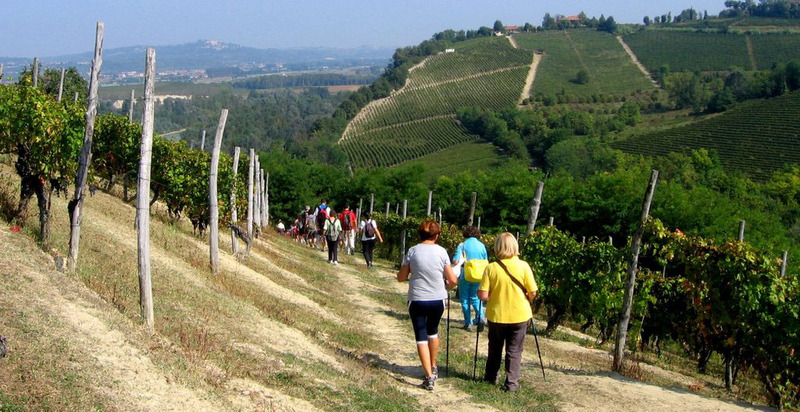 We bring the beer theme onto our hike among the wild hop in Langhe. We end up at the medieval tower Albaretto Torre where we toast in a glass of Alta Langa, a dry vintage spumante, made as Champagne, from hand picked Pinot Noir and Chardonnay grapes. We make a visit to Sergio and Elena and their winery in Alta Langa where they make most of the fieldwork themselves. Traditional Piemontese flavours for dinner at Le Querce. What about a morning swim in the pool before we head back to the airport? Grazie e bentornati!